Red is the color of passion, desire, and love - OOO LALA! We can't resist the trend! A red dress is perfect for both a casual and glam affair. Be a showstopper in ravishing red! Follow our guide to find the right shade for you. Abbey's bridesmaids looking gorgeous in the Madelyn style in Hibiscus by Jenny Yoo! For our fair friends, you want to look for a shade of red that has orange undertones to illuminate your complexion. Veare towards dresses that are tomato or coral red. You lucky ladies can wear any shade of red! 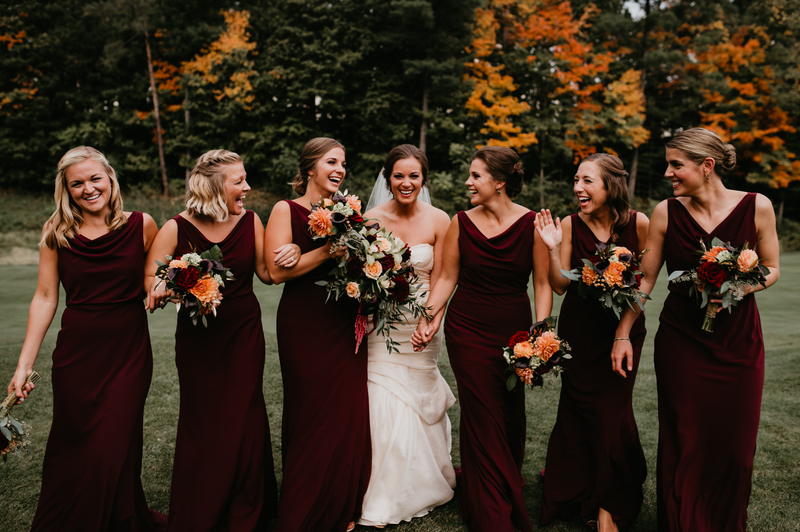 Since you have SO many options to choose from, brighter shades of red are perfect for spring and summer weddings while deeper reds are better for the fall and winter. Our dark complected darlings look fab in cool reds! When choosing a red dress, choose from hues that have blue and plum undertones. P.S. We heard a rumor that redheads can't wear red. But, turns out they look radiant in it!